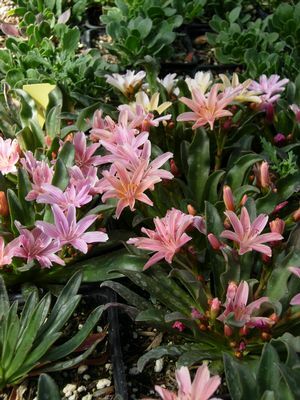 Lewisias are named for Meriwether Lewis of Lewis and Clark fame. These succulents are attractive, colorful additions to containers and rock gardens. Plant in sun or light shade and provide really good drainage. Allow the soil surface to stay dry if possible otherwise the lower leaves tend to rot if they're in contact with wet soil all the time. You can avoid this situation by spreading a layer of fine gravel or small pebbles under the leaves. Lewisias provide nectar for hummingbirds. Plant at a slight angle to prevent water collecting in the base of the leaf rosette and rotting it. Lewisias are easy to kill with overwatering. Let the soil dry out between waterings. Sprinkle a layer of gravel under the leaf rosette so the lower leaves won't rot if they're in contact with wet soil. If the lower leaves do die, they can easily be pulled away; just take hold of the leaf near the base and pull or tear gently.